Now that the July live period is over, so too is the travel basketball season. As is our custom here at the Source Hoops Hacienda we hand out multiple awards in various categories for the rising senior (2019), junior (2020) and sophomore (2021) classes. The first category is Most Valuable Player. We define that as the player who was most instrumental in leading his team to success. There were a lot of possible nominees for this category. Both teams on the Adidas Gauntlet circuit, Team Parsons (CP 25) and Team Knight, each fared well during both April live period weekends as well as in July, most notably at the Summer Hoops Festival and Super Showcase. In Nike’s EYBL, both Florida entries, Nike Team Florida and Each 1 Teach 1, qualified for the Peach Jam. Team MOAM can’t be left out with their championships in the Atlanta Jam, Best of the South, and the Super Showcase. As a result, there were a lot of players that were instrumental in leading their respective teams to success. In looking over who elevated their play over the course of the spring and summer as well as that of their team, it seems no player did more in both areas than C.J. Walker of Each 1 Teach 1. The 6’8 forward was the ONLY player on a Florida-based team to earn awards for each session of the EYBL (three honorable mentions and one first team nod). Overall, he was named All-EYBL second team for the four “regular” sessions. In addition, he earned third team All-Peach Jam status despite Each One Teach One’s inability to capture a win during pool play. Walker’s play also elevated him in the eyes of national scouts and high-major college coaches. 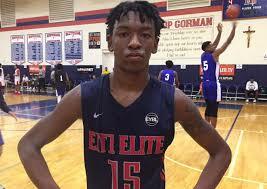 Some national scouts consider him a potential McDonald’s All American Game participant and a player that has become a true national recruit and not just an SEC/ACC regional guy. As such, high major programs such as Arizona and Oregon in the West and Texas and Missouri in the South and Mid-West are hoping to get involved with his recruitment. Going 1-7 in the Under Armor Association certainly does not equate to success. Unfortunately, that is what happened to a talented but young and inexperienced Team Breakdown during the April “live” period. Fast forward to July at the Under Armor Invitational and the team appeared to have righted the ship with three wins over fellow members of the UAA before bowing to eventual champion New Heights in bracket play. Keying this resurgence for the Pink and Black was 6’1 guard Jamal Mashburn, Jr., who gets our nod for 2020 MVP. During the two sessions of the UAA, Mashburn averaged 19.9 points a contest, the most of any player on a Florida-based travel team in the various shoe circuits. In July at the Hoops Festival, playing against 17U teams from other shoe circuits, Pro Skills from the EYBL and Team Loaded VA from the Adidas Gauntlet, Mashburn proved he could compete and score against any one. Mashburn will be joining a loaded Brewster Academy team in New Hampshire for his junior season. Going against such talents as Jalen Lecque (2019) and Terrence Clarke (2021) every day will only improve Mashburn’s game. It will be interesting to see what new elements he develops to his game over the next several months. Warren Lynn Kidd, a 6’9 forward out of The Rock School in Gainesville, moved over to the Georgia Stars this season. Playing up in the 16U Division at the Best of the South, Kidd was a big reason the team won the Gold bracket title. Earlier in the summer, Kidd attended Nike’s Elite 100 Camp featuring the best members of the Class of 2020 and 2021 and reportedly more than held his own. He’s become more comfortable handling physical defenders inside and has developed a variety of post moves with which to score. He’s a good athlete and as such he’s becoming an early target of high majors.